After crashing his gangster stepfather's prize car, Adam (Jack O'Connell – This is England; Harry Brown, Eden Lake) is forced to repay the debt by teaming up with professional hit man, Roy (Tim Roth), to act as driver on what should be a swift and easy mission. Whilst Roy desperately wants to leave the killing game, Adam develops into an enthusiastic and aspirational hit-man. The pair take a road trip ending deep in a forest, far away from home. Roy executes the target with ruthless efficiency only for the duo to then realize they've been caught in the act. A beautiful, mysterious young woman (Talulah Riley – St Trinians 1 & 2, Pride & Prejudice) has witnessed the murder and professional code dictates that she must also now be dispatched. As the two men deliberate over killing her, their witness makes her escape with an incriminating piece of evidence. Thus begins a cat and mouse chase that ultimately reveals the sinister reason for Adam's stepfather (Peter Mullan (War Horse, Tyrannosaur) having commissioned the deadly hit and the true identity of their witness and her reasons for seeking retribution on the gangster. Directed by Craig Viveiros (Ghosted) and co-starring Peter Mullan, Kierston Wareing (Fish Tank) and Christopher Hatherall (also Ghosted), The Liability was described by Britfilms as "a film that deserves to do well and will surely be watched for years to come" and a more cautious DVD Verdict as "a decent little crime thriller." 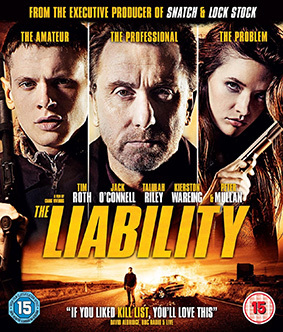 The Liability will be released on UK Blu-ray and DVD on 27th May by Metrodome Distribution at the RRP of £19.99 for the Blu-ray and £15.99 for the DVD.